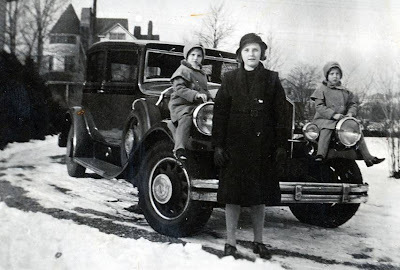 My mother is standing in the foreground with her two little twin sisters, in their driveway (not sure where the next younger sister was). I remember so well this intriguing house across the street with the turret. Some old lady sisters lived there as I remember. The ______ Sisters. I don't remember ever meeting them, but there is a dim recollection of entering their darkened parlor. This photo brings my grandparents' house to mind, and all the fun we had as children when we'd spend a week there very summer. This photo sure makes it look like my mom is the leader, and in fact she was, being the oldest of four girls. It makes me think of myself, as I tend to be an "in charge" kind of person, though I don't really like that about myself. I'm glad I have the ability to organize things, but there's great relief when someone else takes over.